The Holt Twins harmonize and blend voices in a beauty and a closeness attainable when you are fortunate enough to enter the world identically! Senses bridge between two individuals to form one. Combine this with a talent to sing, compose, and play a variety of instruments, and you learn the meaning of harmony. Originally from Sinking Spring, PA, this unique act started performing when just teenagers and quickly became the most requested act in Berks County so much so that even 15 years into their performances they were requested to be the main act at Reading's Best Fest. For Linda & Emily it’s not just about who they’ve met or played with along the way of their journey, but more importantly it’s about when those people that they’ve met who inspire them encourage them…… when working with Richard Evans, (producer & arranger for many artists including Natalie Cole, Peabo Bryson, & Ramsey Lewis & now a Professor at Berklee College of Music), he recognizes their talents & tells them how well they sing; when they not only perform in front of Tom Chapin, but he asks them to join him on stage & sing a song with him; when sound engineer James Hodgkins, ("Uncle Wiz"), of James Hodgkins Audio Productions tells them that they are the best singers he’s ever had in his studio; when Dave Plank,(“Planky”- Patsy Kline’s music coach), tells them after their show at Haycreek Fall Festival, “That was a great show. You harmonize beautifully together & coming from me that means a lot”; when the 2 people they admire the most- their older brother, Professional Percussionist Brian Holt, and their older sister, Professional Flautist and Piccolo Player Wendy Holt Schmehl, support them. And then there are all the friends & fans who love their music & the people who tell them that they’re playing music now too because as a child they were inspired by watching The Holt Twins perform. These are the things that matter & the things that make life worth living & songs worth singing. Joining them for TwinSister are 2 talented musicians: Rich Arteca, a lead guitarist & acoustic guitarist from Long Island, NY, has been with TwinSister since 1977 & has co-written some of their songs; Jimmy Reed makes the band complete with his showmanship & expertise in drumming. He comes with much experience including being in a band that toured with Cinderella and Poison back in the '80's. And sometimes their daughter, Charmaine, joins them to add some extra harmonies with her beautiful voice. The Drummer for The TwinSister Album "Fallen Butterfly" is the very talented Troy Lupold.TwinSister with it's special brand of "Twin Rock" has entertained fans on the east coast in Rock and Roll Clubs, Teen Clubs, Campgrounds, Universities, the major shore points of New Jersey, and throughout the Midwest. 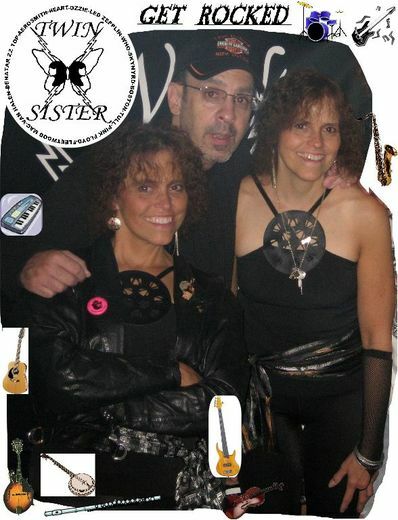 TwinSister is not just another Rock & Roll Act- they are a Classic Rock Show Band who can play flawless Originals & timeless Classics from bands such as Heart, Pat Benatar, The Who, Jethro Tull, Led Zeppelin, etc....A polished, professional act with lots of showmanship! Their music is a production of kickin' rock songs & acoustic songs sung with strong, harmonious, female vocals using a variety of instruments with double leads. They were nominated for "Best Rock Band", "Best Easy Listening Band", & "Best Folk Band" in the Indie Music Channel Awards" 6 years in a row for their songs "Missing The Turn", "Dorothy", "The Star", "This Memory", "Where Are We Now", & "The Poet". In 2014 they won the award "Best Rock Band" with their song "Dorothy". In 2015 they won 'Best Easy Listening Band" in The Indie Music Channel Radio Music Awards for their song "Where Are We Now". They are honored to be among The 2017 Inductees to the Berks County Rock & Roll Hall of Fame.